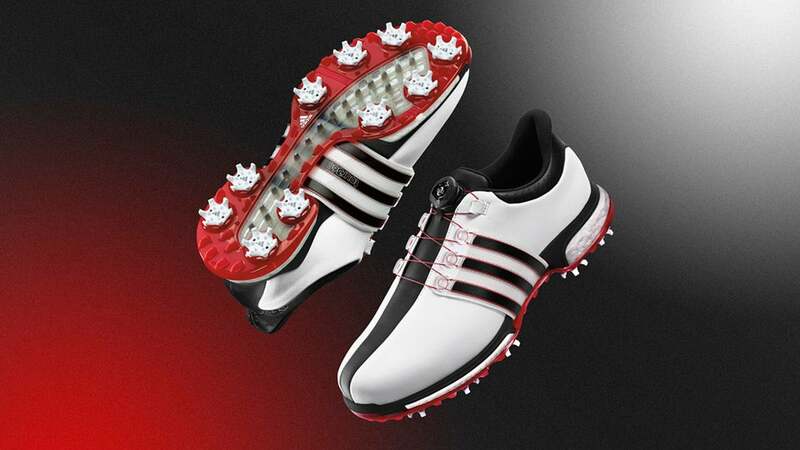 Adidas TOUR360 Boost BOA golf shoes are available at retail. The BOA version of the TOUR360 Boost ($230), which features the Boa Closure System, is now available at retail. In addition to the 360WRAP midfoot support technology that's run through the entire TOUR360 line the BOA Boost features full length cushioning provided by BOOST foam as well as a 10-cleat dual-density outsole. Unlike past TOUR360 models the newest shoe is designed with a full-length outsole rather than two separate sections in the forefoot and heel. This design provides enhanced arch support and traction while maintaining independent flexibility in the front and rear of the shoe. Premium leather uppers provide a soft feel, added durability and improved fit. To date TOUR360 shoes have been worn in 38 PGA Tour victories. Unlike the standard TOUR360 Boost the BOA Boost provides micro-adjustability for a customized fit utilizing an incremental pull and push structure in the top center of the tongue of the shoe. Nylon coated laces that weave 49 strands of stainless steel material are connected to the Boost's 360 Wrap design and controlled by a unique IP1 Boa dial that increases or releases tension in one-click increments. The TOUR360 BOA BOOST is the only shoe with the IP1 dial that offers infinite levels of adjustment. The TOUR360 BOA BOOST is available in three colors and medium and wide widths.